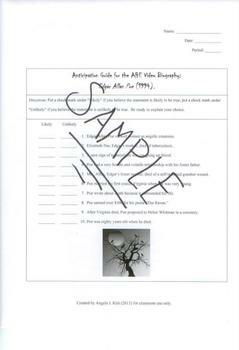 An anticipation guide is used to help students begin to organize their thoughts and ideas about a certain topic of study. It is a pre-reading comprehension tool. The focus of an anticipation guide is not on so called "right" or "wrong" answers, but more on the reasoning behind "why" a student believes a given statement is likely or unlikely. Anticipation guides are used prior to beginning a new course of study. The following anticipation guide is one I have used multiple times in my Sophomore English classroom. The students really enjoy it, and we always have excellent discussions following the completion of the guide. 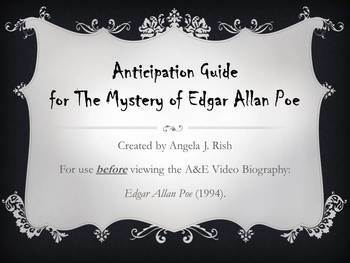 The students’ anticipation is then built for the viewing of the A&E Video Biography: Edgar Allan Poe (1994) http://www.biography.com/people/edgar-allan-poe-9443160/videos/edgar-allan-poe-full-episode-2104513528. After watching the biography, we go back to the anticipation guide to see if our thoughts or ideas have chanced concerning each statement. [*If you are looking for questions to go along with the A&E Video Biography: The Mystery of Edgar Allan Poe (1994), please check out my listing http://www.teacherspayteachers.com/Product/AE-Video-Biography-The-Mystery-of-Edgar-Allan-Poe-1994-Questions-677947]. I use both during my unit on Edgar Allan Poe.